I come from a long line of worriers. Part genetic (my mother) and part cultural (being Greek). I grew up surrounded by people who considered it an art form, complete with a set of worry beads to hold while performing their craft. My grandfather would sit in his recliner for hours, his thumb moving the beads back and forth while the strand was draped around his hand doing nothing but worrying. I have no idea about what. Like most men of his generation he was not a man of many words. My mother inherited his obsession. She tells me that she was born with two worry birds, one sitting on each shoulder. Lucky for her she married my father, who didn't worry about very much. It was a good balance. He tried to get her to stop. He would tell her not to worry so much. She would tell him she couldn't help herself. It was a dance they did their entire marriage. I had a front row seat to see how much time could be wasted worrying. The evidence was right in front of me that worrying would not change a thing. You can't stop anything from happening by worrying. Nor can you make anything happen you are worried won't. You would have thought I would have learned not to worry at all. To be more like my father. Some days I am. But as I said, this worrying thing is in my blood. It can sneak up when I'm least suspecting. And if it gets me in its claws, well, I can lose a whole day. 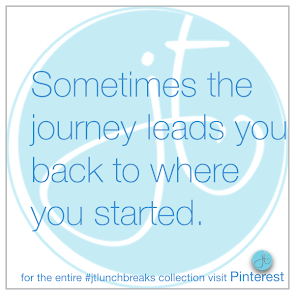 So I'm always looking for tools to help when that happens. Tools like The God Box. 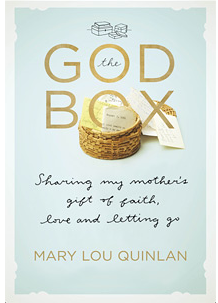 The God Box is the title of a memoir in which the author shares her mother's gift of faith, love and letting go. Mary Lou Quinlan's mother kept a God Box for years, a collection of notes to God on behalf of family, friends and strangers in which she would ask for help without expectation. Instead of worrying, she would write it down, drop it in the box and let it go. Or as I like to say surrender to a power greater than herself. When her mother died, Mary Lou uncovered ten God Boxes stuffed with little pieces of paper that spanned the last twenty years of her mothers life, offering a wealth of insight into her mother as well as herself. It's a wonderful story I highly recommend, as long as you have a big box of tissues next to you and no where to go until the puffiness from all the crying subsides. I had the pleasure of hearing Mary Lou speak the other week. The God Box, it seems, has taken on a life of its own. There is a website, The God Box Project, a play, and yes, even an App if you want to create your own God Box and don't want to kill a tree in the process. It doesn't surprise me how this has caught on. Whatever your image of a higher power is, God, Goddess, Buddha or Allah, surrendering your worries to them by writing on a slip of paper, asking please and thank you, is a wonderful symbolization of release. By doing this, you feel like you've done something when really all you've done is delegate it. The worry bird is off your shoulder and in the hands of someone who might actually be able to do something about it. I think that's pretty efficient business and what I consider a true time saver. Yes, if you are wondering, I have started a God Box of mine own only I call mine my God and Goddess Box. I believe they work better together than alone. PS. The God Box, like most books, mine included, make great holiday gifts!